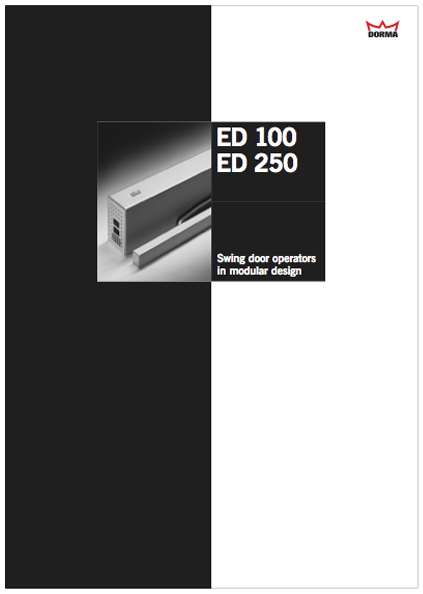 The DORMA ED100 and ED250 are compact next generation electromechanical swing door operators that are innovative, simple, and elegant. The operators are discreet both visually and audibly. Their elegant Contur design blends into and enhances any décor. With virtually silent operation, the automation of the door can be easily integrated without compromising the style and feel of the entrance. The ED100/ED250 operators reflect DORMA’s commitment to the environment in both manufacture and performance. Each unit is smaller and lighter than previous swing door operators. Lower weight in turn reduces the amount of energy required for shipping. 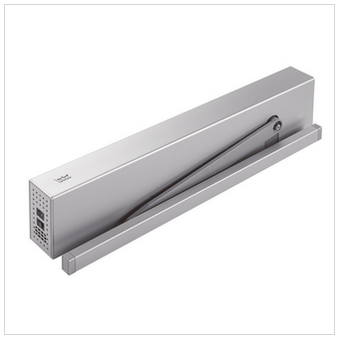 Once installed, the ED100/ED250 helps to minimize heat loss due to doors closing improperly. The TMP Temperature Management Program extends the life cycle of the operator, tested for 1.000.0000 cycles.